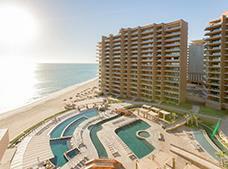 Rocky Point (Puerto Penasco in Spanish) is a newly developed tourist resort in the Mexican state of Sonora. Due to its proximity to the US border, it has become the preferred beach retreat for thousands of Mexicans and international travelers because of its beautiful beaches and mild, sunny climate. Rocky Point (called Puerto Penasco in Spanish) is a newly developed tourist resort in the state of Sonora. Due to its proximity to the US border, around 65 miles away, Rocky Point is rapidly becoming the preferred beach retreat for thousands of Mexicans and international travelers who are attracted to the area because of its beautiful beaches and almost year-round mild, sunny climate. Rocky Point is an excellent destination for people who seek an exciting, adventurous vacation and also for those who prefer a tranquil, relaxing place to rest and relax. Expansive clean beaches, sunshine for almost the entire year, an average temperature of 68 F, and an ever-growing list of lodging options make it an attractive choice for travelers of all budgets. Rocky Point's skyline is dominated by an abundance of villas, condos and vacation rentals, but there are also plenty of ocean view hotels, motels, and private residences. All in all, Rocky Point offers everything you would expect from a world-class beach destination, including golf courses, large resorts, and restaurants...all with that special Mexican touch. Because of its burgeoning growth and over 60 miles of coastline, Rocky Point has become a paradise for investors and real estate agents. The local building industry is constantly on the rise, and it is common to see complexes, towers and new developments under construction. The supply and demand of condos, villas and hotel rooms keeps increasing as more people become aware of this new vacation paradise. The origins, of what is now a paradise for vacationers, date back to 1927, when Rocky Point was just a small fishing village. It consisted of just a few anglers from the nearby towns, who found in the surrounding waters an extraordinary abundance of marine species. By 1929 the area was already known as "Punta de Piedra" or "Punta Penasco", (Spanish for Rocky End), because of the rock formations that stand out from its beaches. Finally, in 1952 Rocky Point became an official municipality. With a buoyant fishing and tourist industry, Rocky Point is becoming a very popular option for vacationing, resting, and enjoying water activities like sport fishing, diving and many others. Thanks to its convenient location near the US, along with its gorgeous beaches, hectic nightlife and affordable lodging, Rocky Point has progressively become a favorite destination for thousands of university students from Arizona, California, Colorado, New Mexico and many other southern American states. Likewise, Rocky Point is an attractive beach destination for an increasing number or retirees and senior travelers, who normally spend extended vacations enjoying the private villas, condos and ocean side resorts. In recent years, business travelers have also begun to see Rocky Point as a convenient gathering point, as it features a growing variety of hotels, accessible rates, and excellent meeting and event facilities, most of them located inside the hotels. So, whether it is for business or a fabulous vacation, accompanied or by yourself, visit Rocky Point and enjoy this ever-changing destination!